A peace walk or peace march, sometimes referred to as a peace pilgrimage, is a form of nonviolent action where a person or groups of people march a set distance to raise awareness of particular issues important to the walkers. 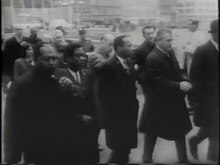 A 1967 newsreel depicting several peace walks. Europe is launching its first permanent Peace Walk Route, that will run along the former division between East and West Europe and end in Trieste, N-E Italy. A pan European network is currently working on its Design, and it is set to open in 2014, to mark the 100th anniversary of World War I. One famous example was that of Vinoba Bhave, who undertook a peace walk with many of his followers throughout India for land reform. A recent peace walk campaign named Freedom Walk was organized by the Free Software Community in Kerala in 2008. 4 volunteers walked 750 miles (1,200 km) from one end of the state to the other to promote Free Software. A peace walk was undertaken in 1962 by Satish Kumar and his companion who walked without money from India via the Soviet Union, France and the UK to the United States (using ships to cross the channel and Atlantic). Vinoba gave 2 gifts to Satish and his companion: pennilessness, i.e. voluntary poverty, and vegetarianism. Early in 1984, peace campers walked 26 miles from Daws hill to Naphill through country roads and countryside to raise money for The Angry Pacifist magazine. The King-Carter Freedom Peace Walk is a 1.5-mile walkway in Atlanta, Georgia's (USA) Freedom Park. It commemorates the only two Georgia winners of the Nobel Prize for Peace: Martin Luther King Jr. and Jimmy Carter. Various peace organizations throughout the United States have organized marches and vigils to protest the Iraq War, since before the war started in 2003, and then annually ever since. Sometimes these marches are coordinated to take place on the same day across the nation. In San Diego, the greatest number of anti-war protesters, an estimated 7,000, turned out for a demonstration on March 15, just five days before the beginning of the Iraq War. Peace walk for the Unity of Hungary, on the 29th of March, 2014. "The Interfaith Pilgrimage for Peace and Life" started in Auschwitz, Poland on December 8, 1994, and ended in Nagasaki on the fiftieth anniversary of the Nagasaki bombing, 9 August 1995. It was led by Nipponzan-Myōhōji Japanese Buddhist monks. The monks, however, were dwarfed in number by American, European, South American and Japanese lay people. The trip was organized to both commemorate the 50th anniversary of the end of World War II as well as to be witness to the suffering in contemporary war zones. The group walked from Auschwitz to Vienna, then travelled through Croatia, Bosnia and Serbia. They crossed the front lines of the Bosnian war in Mostar and held a day of vigil, fasting and prayer there. The next leg took them through Israel, the Gaza Strip, the West Bank, Jordan and Iraq. The group travelled across the front lines in Cambodia, where they joined the Dhammayietra, an annual Cambodian peace walk led by "the Gandhi of Cambodia" Maha Ghosananda. They then visited war sites in Vietnam and the Philippines before going to Hiroshima and Nagasaki. This walk was one of many peace pilgrimages organized by the Nipponzan Myōhōji monks, but it was the largest in scale, number of participants, time, and distance travelled. Over 1000 people participated in at least part of the pilgrimage, including Buddhists, Quakers, Catholics, Muslims and Jews. The pilgrimage received media attention and books were written about it. "A Walk to Moscow" was a peace walk, one of many walks for peace in the 20th century. These were specially organized by groups of pacifists and peace activists who wanted to make some protest against the politics of war and the use of chemical, biological and nuclear weapons. In the early 1960s, there was a walk across the United States, Europe and the USSR (its history is told in a book You Come with Naked Hands by Bradford Lyttle. In the 1980s, a group organized to walk across America and through Europe to Moscow to show solidarity with all people and to demonstrate in a grass roots way that all people are linked by their right to live on the earth in peace and safety. 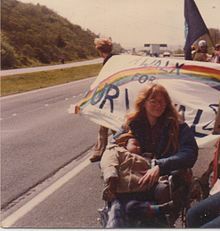 This walk was conceived by organizers while on another peace walk "A Walk for Survival" (from Santa Cruz, California to Washington State) in 1980. While at a requested meeting with the Russian Consulate in San Francisco one organizer, Jack Chalmers asked if we continued our walk across America, and Europe would we be allowed to walk to Moscow? The Consulate answered "of course". "A Walk for Survival" ended at Bangor, Washington State at the site of a Trident nuclear submarine base, and the organizers immediately started planning "A Walk to Moscow". The walk started in Bangor on March 1, 1981 and reached the East Coast in time to winter it out in Boston, before flying to Europe in March 1982. The summer of 1982 was spent walking across the UK (with a side-tip to Ireland), France, Belgium, and Federal Republic of Germany (with a trip to West Berlin by bus which returned to its starting point in order for the walking route to continue uninterrupted.) The Walk operated by sending advance teams a few weeks ahead to cities and towns along a prospective path to set up press, speaking engagements and accommodations for the group. Decisions were made only by complete consensus, which often led to long and stormy meetings. The German Democratic Republic had refused entry to the group, so they walked south to Bavaria and stayed there for the winter, while negotiating visas for Czechoslovakia, Poland and the USSR. A Walk to Moscow (the indefinite article rather than the definite "The Walk" was important to many of the original walkers, as it implied that it was only one initiative, and others would hopefully follow. The distinction was, however, lost on people in the Eastern countries of the route,as Slavonic languages do not have words for either an or the!) spent nearly a year in Europe working from an Old Mill in Regnitzlosau in Bavaria, Germany. It was difficult to get the governments then in the Communist Bloc to allow the group to walk through their territory. While the group negotiated with the government of Czechoslovakia, Poland and Russia the walkers visited many places on foot in Germany and gave talks to local Peace groups. Some members of the group got involved in passive resistance chaining themselves to railings over conscription in Germany or others fasted for peace in the world. Members went to Denmark to join in with peace groups and talk about the walk. In 1983 visas were obtained for Czechoslovakia and Poland, and a continuous walking route was planned and successfully carried out as far as the border between Poland and the USSR. Relations with official "peace" groups in those countries were tricky, and the Czech government tried to incorporate the initiative into their showpiece pro-Warsaw Pact 1983 conference in Prague - however the group did not partake, although a few members lobbied delegates outside, and were invited in for one discussion). Walking across the USSR was not permitted however. The group entered and transited to Minsk, then Smolensk, hoping for some compromise in negotiations, but this did not happen. At this point many of the members chose to return, and not go to Moscow; the others tried to walk to Moscow anyway, but were immediately apprehended and sent to rejoin the others in Minsk. Some members went to Denmark to join in with peace groups and talk about the walk. When the walk finished some people from the group talked at a CND rally about their work and the passive resistance movement. The group membership was international, people came from all over the world to join in and make a difference. Some Walk to Moscow participants later met with other walks that crossed the U.S. and Europe, including Walk of the People - A Pilgrimage for Life, which occurred from 1984 to 1985. The Women Cross DMZ (Korean demilitarized zone) group, which includes noted American feminist and activist Gloria Steinem, Nobel Peace Prize laureate Mairead Maguire, and organizer Christine Ahn with other activist women members, have conducted a peace symposium in Pyongyang on May 20, 2015 and this women group walked across the DMZ, separating North and South Korea for peace on May 24, 2015. ^ Ellwood, Robert S. The Fifties Spiritual Marketplace: American Religion in a Decade of Conflict. Rutgers University Press. p. 92. ISBN 0-8135-2346-X. ^ Freedom Walk, covered under community events in FSF Blogs. ^ Toppa, Sabrina (May 20, 2015). "Gloria Steinem in North Korea for DMZ Peace March". Time. This page was last edited on 22 April 2019, at 06:18 (UTC).